From debut author, Tamsyn Muir, the Ninth House trilogy (GIDEON THE NINTH, HARROW THE NINTH, and ALECTO THE NINTH), an epic science fantasy that blends necromantic theory and thrilling swordplay with a wicked, sacrilegious sense of humor; a modern mix of Dune, Riddick, and Gormenghast. Tamsyn’s works have appeared in Nightmare Magazine, F&SF, Fantasy Magazine, Weird Tales, and Clarkesworld. Her fiction has received nominations for the Nebula Award, the Shirley Jackson Award, the World Fantasy Award and the Eugie Foster Memorial Award. 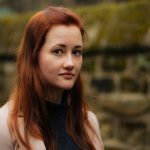 The Ninth House trilogy was acquired by Carl Engle-Laird at Tor.com in a three-book deal, negotiated by Tamsyn Muir’s agent Jennifer Jackson. The first book, GIDEON THE NINTH, is expected to publish in late 2019.